I like the look of layering design elements on a card. Some stampers call it a Stacked Collage technique. A mix of textures add to the collage look. 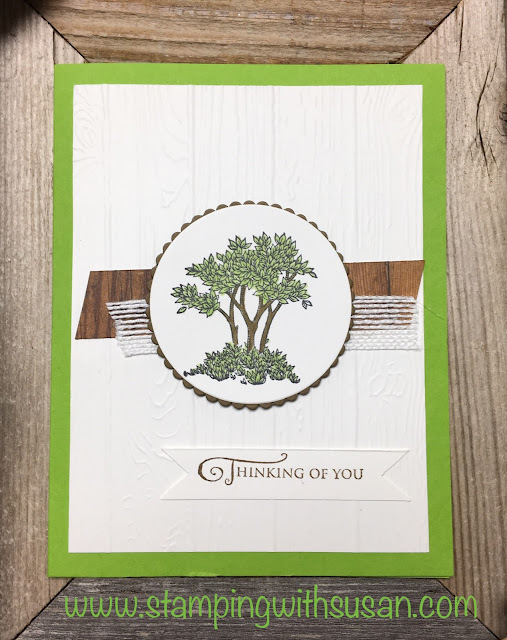 It's hard to see but the larger Whisper White cardstock is embossed with the Pinewood Planks Embossing Folder. I wanted the focus to be on the tree. 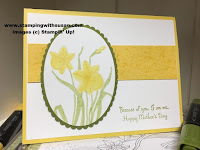 I wasn't sure I would like Soft Suede and Granny Apple Green together but it works for this card. What do you think? This particular stamp set has a nice set of greetings in a pretty font that is gender neutral. "Thinking of you" is one of those generic greetings that can really be used for any occasion, from birthdays to anniversaries to get well or sympathy. It's nice to have a stash of "Thinking of You" cards ready to give to someone.